Winter is not known as “cough and cold season” for no reason. It’s one time of the year when a cold can rip through your community and attack nearly everyone you know. Since we often spend more time indoors, in enclosed spaces with recycled air, you’re a lot more likely to get sick during this season. 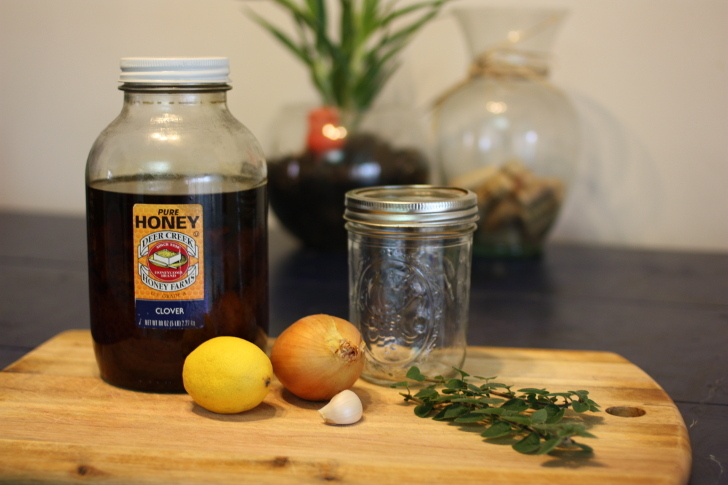 Natural antimicrobial properties in honey, onion, and garlic help fight infections in the body. 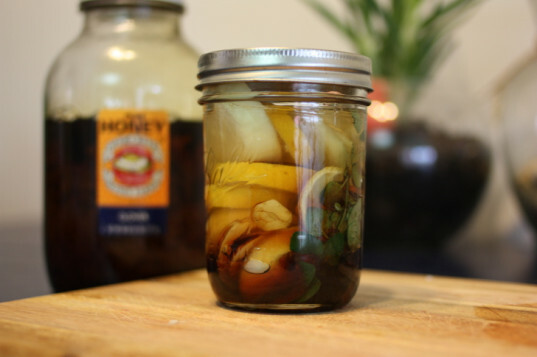 They also work as preservatives to help keep this homemade cough syrup stable in the fridge for up to a week. 2. Banish the germs with natural antimicrobial foods. 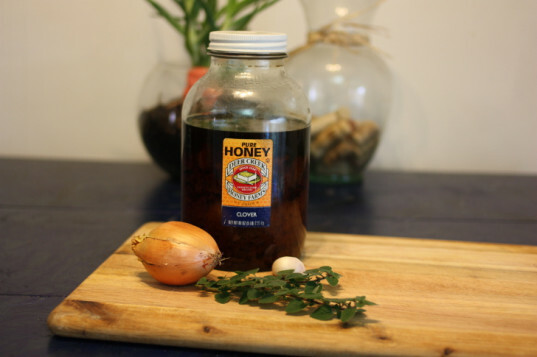 Honey – A natural antimicrobial ingredient, honey helps kill the bad bacteria that makes you sick. It also works to relax the muscles in your throat, which is perfect to combat a pesky cough. Oregano – This is a powerful antimicrobial herb, so it adds a healthy boost to your cough syrup, as well as enhances the flavor. Fresh sage and thyme have similar properties. Slice the onions, garlic, and lemon. Herbs can remain intact, if using. 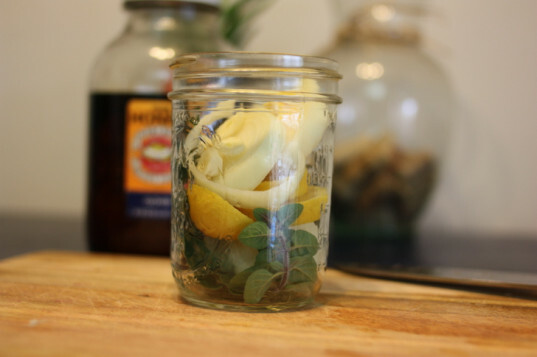 Place the herbs at the bottom of the jar, with the sliced items on top. Press everything down gently to ensure that it will be below the surface of the liquid, once it’s added. 4. Add honey and water. Pour honey over the solids, followed by warm water. 5. Steep, strain, and store. Make sure the lid is airtight and leave to steep overnight at room temperature. Strain the solids through a fine mesh sieve or cheesecloth and reserve the liquid. If you’re in a huge rush, you can skip the jar and put everything in a small saucepan and simmer for 5-10 minutes until the onions just begin to soften, but your concoction will be slightly less potent. 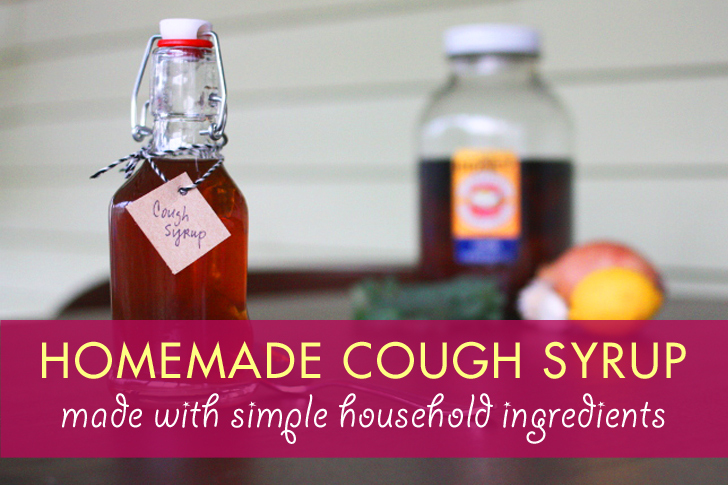 Your natural cough syrup can be stored in your refrigerator for up to a week. This recipe yields about 8 ounces (1 cup). 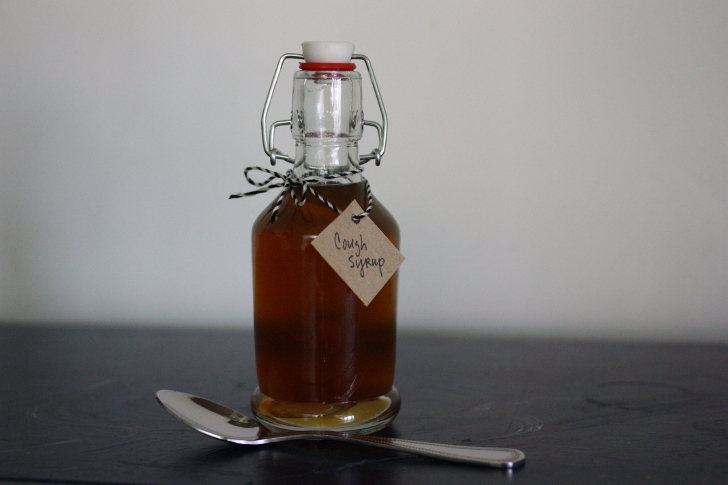 A spoonful of this natural cough syrup will help soothe a sore throat and ease cough symptoms. Because of the honey, the syrup should not be given to infants under 1 year of age, but it’s perfectly safe for older babies and children. It’s best given straight by the spoonful. 2. 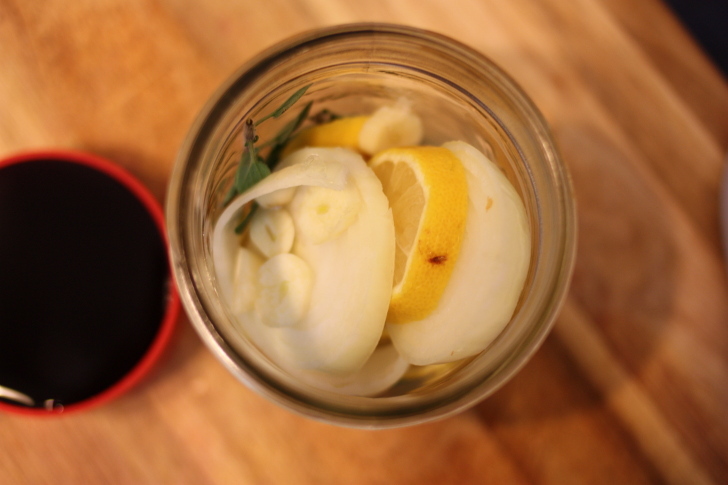 Banish the germs with natural antimicrobial foods. Honey - A natural antimicrobial ingredient, honey helps kill the bad bacteria that makes you sick. It also works to relax the muscles in your throat, which is perfect to combat a pesky cough. Oregano - This is a powerful antimicrobial herb, so it adds a healthy boost to your cough syrup, as well as enhances the flavor. Fresh sage and thyme have similar properties.